Remember this amazing movie by Disney called the Lion King? Remember the first scene where all the animals are going to see the presentation of Simba? In the first minute, you’ll see ants walking in a line, all with a piece of leaf in their mouth. …this is wrong! Or well, these ants do exist, but they don’t occur in Africa at all! That said, they are extremely interesting in many ways, and are studied by many scientists for their interesting way of life. Atta Leaf Cutting ant bringing a leaf home. Picture by Alex Wild. What makes them interesting? Well, these ants do not hunt or eat meat, but they cut the leaves of plants and bring them back to their nest. This is not where it ends though. One could think they would eat these leaves, but the ants actually turned into farmers! They feed the leaves to a fungus they farm, and the fungus turns the leaves in to small foodpackages for the ants. But these are just the basics. In the next few articles I’ll be talking about very interesting and specific things that happen in this interplay between ant and fungus, so stay tuned! 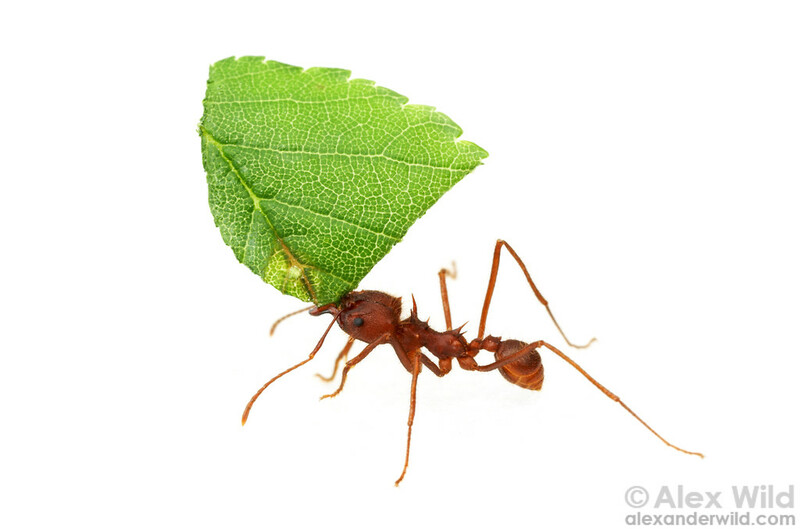 This entry was posted in Species spotlight and tagged Acromyrmex, atta, leaf cutter ant, mutualism. Bookmark the permalink.